In the heyday of British hand tools, a myriad of manufacturers competed to make the best carving chisels. All of these manufacturers followed a set of standard designs refered to as "The London Pattern Book." 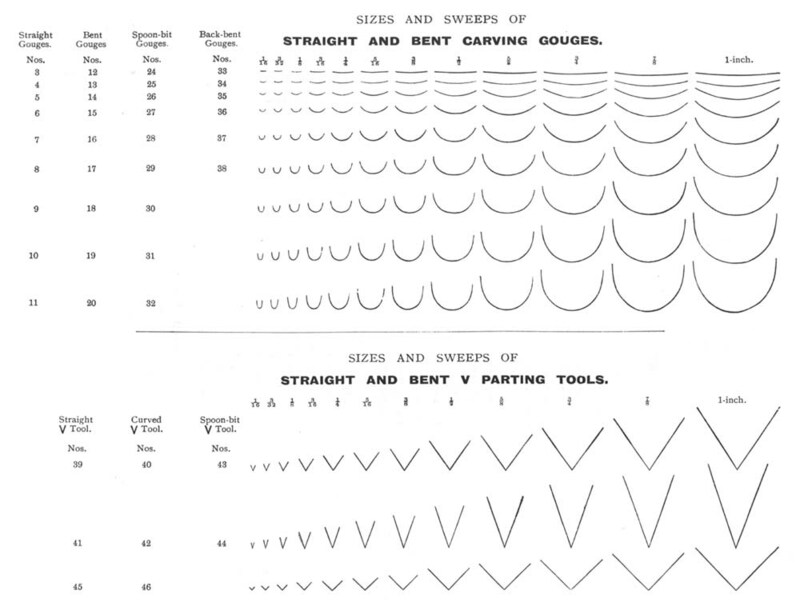 The complete line of chisels called for in the London Pattern Book involved hundreds of distinct chisels. Today, only Ashley Iles still produces all of the carving chisels of the London Pattern Book. Click here to see the London Pattern numbering system. Ashley Iles started out shortly after the War as a small one man operation in Sheffield. At a time when chisel production was going away from the old ways, Ashley Iles was starting out doing things the old way. Later, as the business grew to be the most respected chisel manufacturer in Britain, Ashley moved the business to a modern factory in Lincolnshire, but things were still done to the old standards. No other maker in the world today can boast the breadth and depth of carving chisels that Ashley Iles can. They are not inexpensive, but they are the best. We are closing out our remaining inventory of Ashley Iles individual carving tools. We will continue to offer the sets of carving chisels.